The Preamble of the US Constitution shows how these rights are to be secured including“provide for the common defense, promote the general Welfare”. This entry was posted in Constitution Party and tagged Constitution Party, social security on August 14, 2013 by Krzysztof Lesiak. 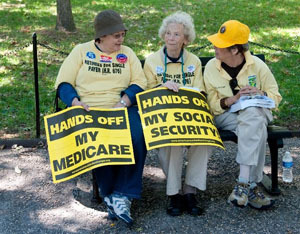 October 2010 rally in Washington, D.C., to defend vital programs. This entry was posted in Socialist/left parties and tagged Freedom Socialist, Freedom Socialist Party, social security on May 13, 2013 by Krzysztof Lesiak. "In the Republican candidate debate last night, I observed that not a single Republican candidate made any proposals for immediate cuts to Social Security, the single largest government program in America. This entry was posted in Libertarian Party and tagged social security, social security cuts on September 23, 2011 by paulie. This entry was posted in Green Party and tagged Green Party, House Democrats, Obama tax-cut, Obama's compromise tax package, social security on December 16, 2010 by Kimberly Wilder.